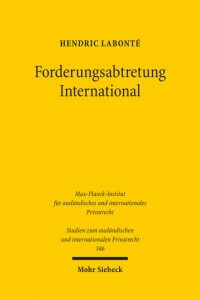 Hendric Labonté has authored a book entitled “Forderungsabtretung International. Art. 14 Rom I-Verordnung und seine Reform” (International Assignments. Art. 14 Rome I Regulation and its Reform). The volume has been published by Mohr Siebeck. It is written in German. The commercial significance of assignments, especially in an international context, requires a straightforward conflict of laws provision. However, art. 14 Rome I does not provide enough certainty, particularly when it comes to third party effects. These should be entirely determined by the law of the underlying debt. Next post: Study on the laws of national civil procedure of the 28 Member States and the enforcement of European Union law.